If you want to "kick it up a notch", try adding our Ionyte natural mineral electrolyte to your pH-FX enhanced water. This "Dynamic Duo" is the "one-two punch" your body needs! 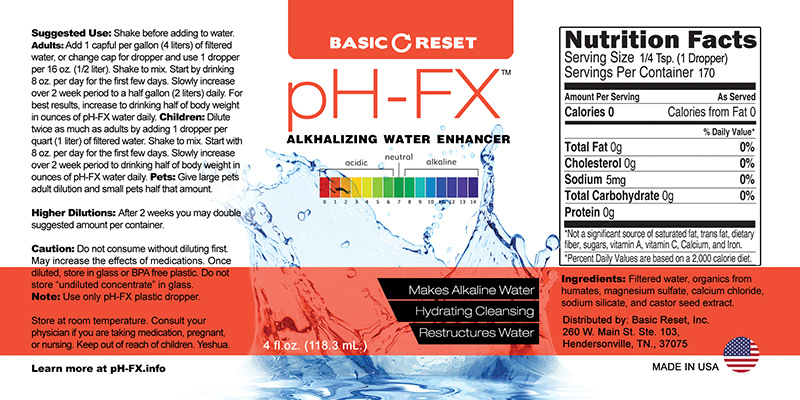 pH-FX is a proprietary formula created through a complex process and is almost entirely made of water. The result of this process is a structured water concentrate that contains trace amounts of minerals which is then enhanced with natural energy. The most abundant element in pH-FX is tetravalent carbon... tetravalent meaning four atoms combined. You should be aware that carbon is at the foundation of all life on our planet. Consider that carbon makes up about 18% of the body, and millions of carbon atoms form the thousands of molecules in our cells. Carbon is the basic building block needed to make proteins, carbohydrates and fats, and it plays a crucial role in regulating the physiology of the body. Our cells use glucose to create energy, which is a compound composed of carbon, hydrogen and oxygen. 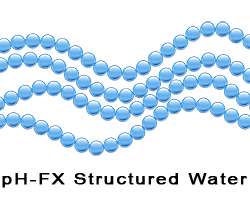 When added to clean drinking water (R. O., distilled, or filtered) the very molecules of the water are transformed to enhance their ability to permeate the cells resulting in increased hydration. Water is not just a bunch of H2O molecules floating around in liquid form. H2O molecules like to connect to other H2O molecules in clusters than resemble a bunch of grapes containing about 14 to 16 molecules. 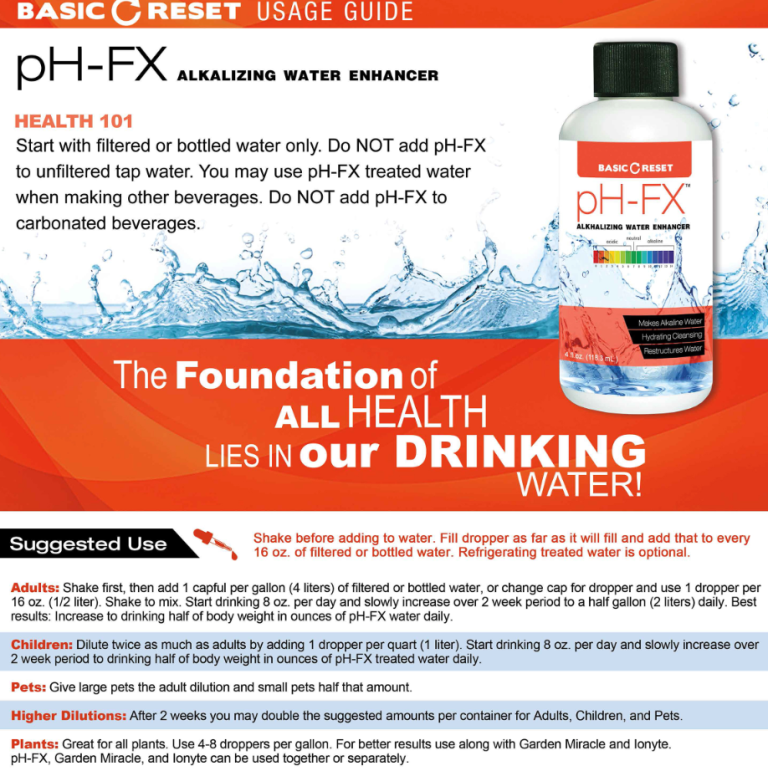 Consuming pH-FX water supports nearly every process in the body. 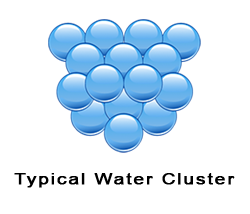 Typical water restructuring involves breaking up clusters of H2O molecules into smaller clusters, usually half-size clusters of about 7 to 8. With pH-FX the clusters are taken apart one by one into single molecules. These molecules are then attached to each other in a structure that would resemble a train. Each water molecule is attached to another, then another in a long string of molecules. This means they enter the cells one at a time, which is the smallest possible way, leading to maximum hydration. Plus, this increase in hydration allows the cells to get rid of all the "junk" and toxins they have been storing. pH-FX is also enhanced with natural energy. If you are familiar with acupuncture, then you know we have energy flowing through our bodies along pathways called meridians. However, sometimes this flow of energy gets blocked. The acupuncturist uses needles to try and unblock the meridians to get the energy flowing again. pH-FX has a high level of energy to contribute to your body which can in a sense "override" the blockages and get things flowing again. These structured and energized water molecules help the body to increase the efficiency of the breakdown and absorption of food nutrients which then helps increase the performance of the various muscles, glands, and organs. This translates into better digestion and the more complete utilization of food nutrients as well as nutritional supplements. 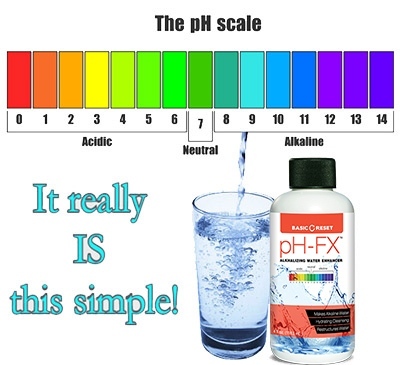 pH-FX does not "provide" nutrients, rather it is a "carrier" of nutrients. This means that you will get greater benefit from anything consumed with pH-FX water, including supplements. How do we know it really does anything more than any other water? pH-FX is so potent that you canâ€™t just start out drinking the recommended half gallon a day. If you drink too much too soon, you may experience minor symptoms of cellular "house cleaning" in the form of a headache or diarrhea. It is necessary to start slowly with 16oz. a day for the first 4 days, then increase to 32oz. a day for 6 days, and then increase to a half gallon a day. This product is not intended to diagnose, treat, cure, or prevent any disease. Consult your physician before use.